Stifado is a Greek classic. Almost every taverna on the islands serves some variation on this rich, tomatoey stew. Tonight we're making it with mushrooms, including dried porcini for extra umami power! Put a large saucepan of water with a pinch of salt on to boil for the potatoes.Boil your kettle. Put the porcini mushrooms in a bowl and pour on the boiling water (amount specified in the ingredient list). Set aside to soak. Halve, peel and chop the shallot into small ½cm pieces. Peel and grate the garlic (or use a garlic press). Chop the tomato into ½cm chunks. Cut each chestnut mushroom into four slices. Peel and chop both the parsnips and potato into 2cm chunks. Add the parsnip and potato to your pan of boiling water. Cook until soft, 15-20 mins. Tip: They are cooked when you can easily slip a knife through. Once cooked, drain and pop them back in the pan with a lid on. Meanwhile, heat a drizzle of oil in a frying pan on medium heat and add the shallot. Cook until soft, 4 mins. Then add the chestnut mushrooms. Cook together until the mushrooms are browned, 6-7 mins. Add half the chopped tomato. Cook for a further 2 mins. When the potato and parsnip is cooked and drained, add a splash of milk (if you have some) and the butter along with a pinch of salt and a grind of black pepper. Mash until smooth, then pop a lid on and leave to one side. Your last job is to make the salsa! Finely chop the parsley and roughly chop the olives. Pop them in a bowl with the remaining tomato chunks and pour in the olive oil (amount is specified in the ingredient list). Season with a pinch of salt and a grind of black pepper and mix to combine. 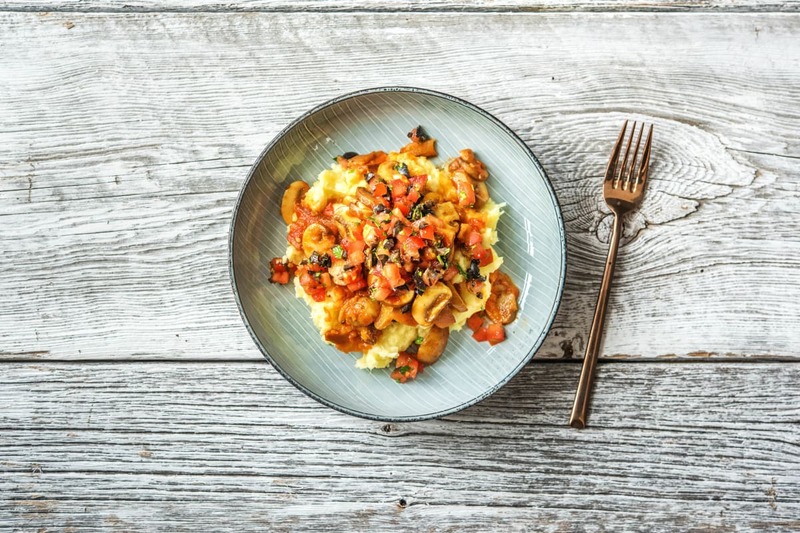 Serve your mash in wide bowls with the mushroom stifado on top and finish with some delicious salsa. Enjoy!